Janice Davis earned her Bachelor of Arts in Human Biology from Stanford University. She is currently pursuing a Master of Public Health from Emory University. Janice has been a writer for almost 10 years. Her work has been published in "Runner's World's High School Runner" and "The Journal of Pediatrics." 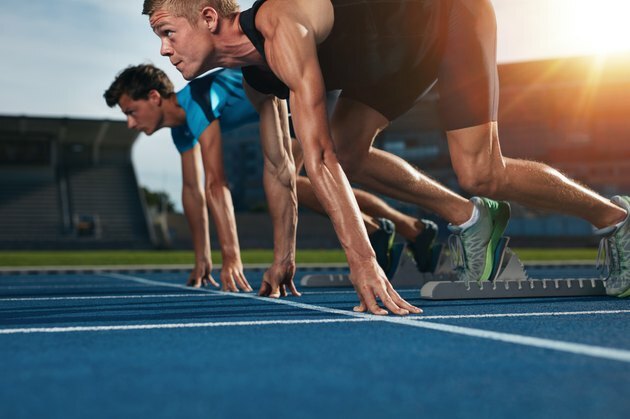 The 300-meter race is considered a long sprint that requires the strength of 400-meter runners and the speed of 200-meter runners. Training requires a mixture of strength and conditioning, speed training and sprinting techniques. To reach optimum performance, implement each component in training cycles so that you are adequately prepared to reach peak performance at the desired time. Training cycles are designed to include off-season, in-season and championship race seasons. 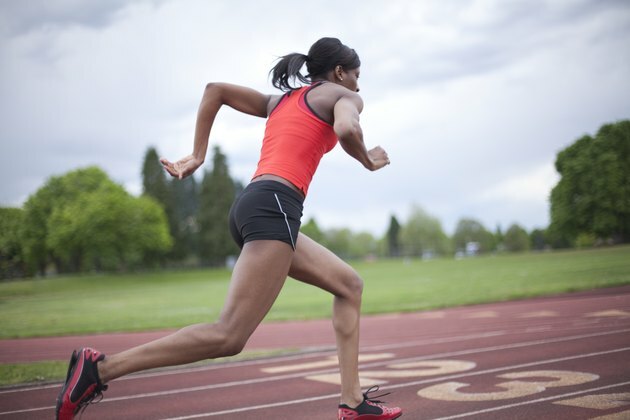 For desired results, increase intensity of workouts as the track season progresses. Run distances longer than 300 meters to build strength and endurance, but do not run longer than 600 meters. 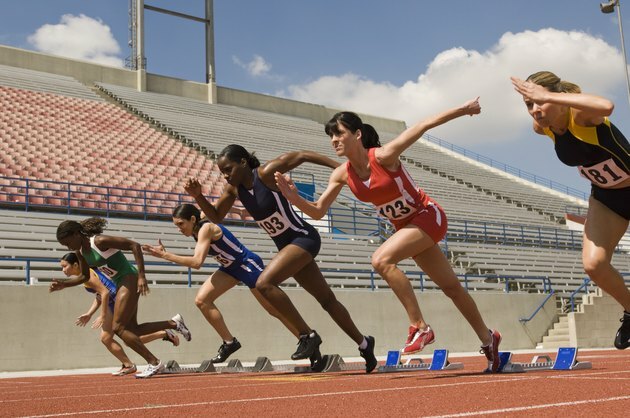 The 300-meter race is still a sprint, so stay below 600 meters to maintain speed endurance. Start off at a moderate pace with more interval running during the first phase of training, but increase your speed and decrease the intervals as the season approaches. Designate three to four days a week to conduct these runs. Lift weights to strengthen the entire body. Include arms, legs, back and shoulders in your weight program. Do various sit-ups and crunches to build abdominal core strength. Set aside two to three days a week to lift weights and conduct plyometric drills that build strength, agility and flexibility. Plyometric drills may include bounding, medicine ball throws, box jumps and hurdle drills. Reduce your workload as the season progresses. Run short sprints during the competitive season. Use a stopwatch to time various sprinting distances. These distances range from 30 meters to 300 meters. Shorter distances improve your top-end speed, while the longer distances improve your speed endurance. Repeat these exercises at least two times a week on the days you lift weights. As your conditioning improves, run these distances at full speed, depending on the distance, or as close to race pace as possible. Practice with starting blocks to get accustomed to race conditions. Adjust each block pedal until you find your desired setting. Drive out of the blocks with your head down and eyes glancing at the track. Over the course of 30 meters, gradually raise your torso and head until you are in an upright running position. Use a starting pistol as you become more comfortable and your technique improves. Soak in cold water chilled with ice after each workout to speed recovery. Warm up and cool down after each workout to prevent muscle strains or pulls. Speed training too early can cause injury. Make sure you are conditioned and prepared to handle the stress.